Subjects, styles, advertising, other relevant information: Frank Peepall was born in 1867, at Andover, Hampshire, son of George Peepall, an agricultural labourer and carter, and Mary Moon. 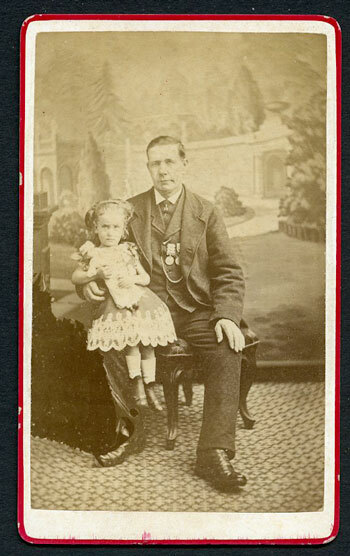 Frank Peepall was baptised on 14-Apr-1867 at Andover. Frank Peepall was listed in the household of Mary Peepall jn the 1881 Census at 20 New Street, Andover, Hampshire: also in the household were siblings George Peepall, Arthur Peepall and Anne Louise Peepall. Frank's occupation was listed as an errand Boy. By 1891 Frank had moved to Cambridgeshire and become a photographer. He was a lodger at 11 Upper Hill Street, Wisbech. His occupation was shown as a photographer's assistant, an employee. He was living at this address with Matilda Williamson b:1819 and her daughter Sapphyna b: 1864. Around December 1893 Frank Peepall married Eliza Ann Beakley b: 1862 Walsoken, at Wisbech, Cambridgeshire. According to the Norfolk Register of Electors in 1899 Frank was living at 32 Norwich Road Walsoken, in 1900 at Marsh Walk Walsoken and from 1901 to 1904 at 7 Leroy Rd Walsoken. 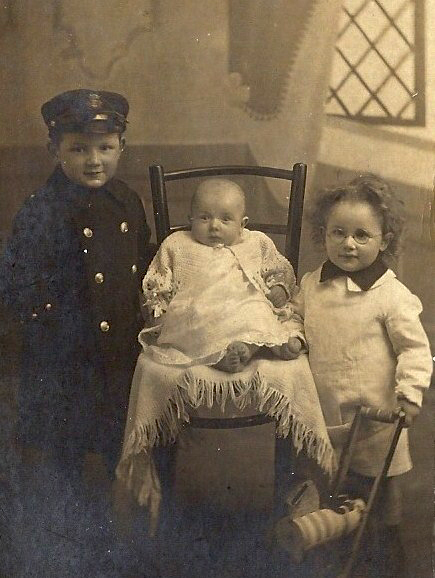 In the 1901 census Frank, still a photographer, an employee, was resident at 7 Leroy Road Walsoken, Norfolk (which is now a part of Wisbech Cambridgeshire), living with his wife Eliza and their children Reginald b:1895 Wisbech, Gladys b:1897 Wisbech and Constance b:1900 Walsoken. Also resident at the same address was 58 year old Harry Carles, a railway clerk. In the 1911 census Frank and his wife and three children were at 26 Mill Lane Barnsley. Frank's occupation was still shown as a photographer but no information was provided about whether Frank was employed or working on his own account. In the 1911 voters register Frank was at 225 Racecourse Rd Barnsley and in 1914 he was at 26 Old Mill Lane Barnsley. In the 1927 Kelly's Directory of the West Riding of Yorkshire Frank is listed as a photographer in his own name at 24 Doncaster Road, Barnsley, Yorkshire, England. References: England Census 1891, 1901, 1911. 1927 Kelly's Directory of West Riding of Yorkshire. We are most grateful to Mark Peepal - mark@markpepall.plus.com for family history information from the Peepall family tree. Mark would appreciate any further information on Frank Peepall. Subjects, styles, advertising, other relevant information: The 1861 census lists Henry as a "photographic artist" in High Street Soham with his wife Matilda b:1833 Soham, and daughters Eliza b:1853 Soham and Kate b:1859 Soham. In 1864 Henry charged a John Cole, farmer, and a John Skinner, beerhouse keeper, at the Ely Sessions, with willfully damaging his photographer's booth at Downham Feast on 7th June. Cole was convicted. The 1871 census records Henry as a "sugar boiler and photographer" living at the Market Place Soham with his wife Matilda, sons George b:1862 Soham, Harry b:1868 Soham and daughter Minnie b:1864 Soham. In 1881 the family were at Churchgate Street Soham. At this time the family comprised wife Matilda, son Harry and son Frederick b:1873 Soham. In 1891 Henry and Matilda and daughter Minnie were living at Churchgate Street Soham, and Henry was described as a "broker and shopkeeper's agent". 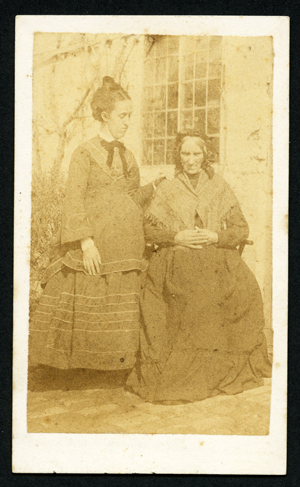 See below a carte de visite of two ladies, one pregnant, by Pendle - 1860s, square corners on the mount, taken outdoors, reverse rather carelessly rubber stamped "from H Pendle, photographer &c High Street Soham". 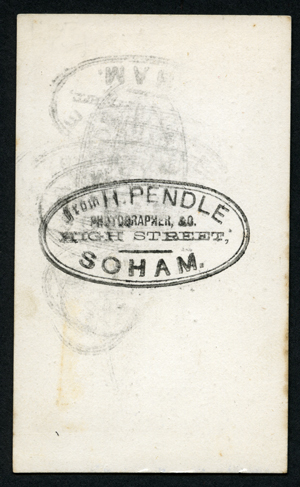 Subjects, styles, advertising, other relevant information: In the 1939 Register Sidney Penfold was listed at the above address and his occupation was shown as a press photographer. At the same address was Alice J.Rattle b: 14/2/1884 a University Lodging House Keeper. Subjects, styles, advertising, other relevant information: In the 1871 census Pentney (mis-indexed as Peutney) was living with his wife Phoebe (spelt Phebe) and two children in Cromwell Road Peterborough - he was a printer and stationer. In the 1881 census Pentney was living with his wife Phoebe and their 4 sons and three daughters at 9 Narrow Street Peterborough where he traded as a "printer bookseller" at premises previously occupied by Thomas Chadwell. He was still in the same business and at the same address in 1901 when he was wrongly indexed in the census as "William Henry Gautney". In 1911 the address was 15 Bridge Street and William was assisted in the bookseller and stationer business by two of his daughters, Mary and Amelia. He was later a local postcard producer, including photographs of Peterborough electric trams in the early 1900s. Not known whether Pentney used his own images in his postcards or those of other photographers. Subjects, styles, advertising, other relevant information: Albert Perkins was the son of Henry Perkins, b: 1827 Bury St Edmunds, a schoolteacher in 1871 and Assistant Overseer of the Poor in 1891. In the 1891 Census, Albert Perkins, then aged 24, was shown as a photographer and an employee. We do not currently know who employed him. In 1901 Albert was married, but away from home, staying in Highgate, Hayfield, Derbyshire. He was shown as an employer, no longer a photographer, but a handkerchief hemmer. Albert died in September 1901, his address at that time being at Highgate Cottage, Hayfield, Derbyshire, aged 34. Address: St Helens, 13 Chesterton Road, Cambridge, by 1911 St Helens, the Common, Southwold. 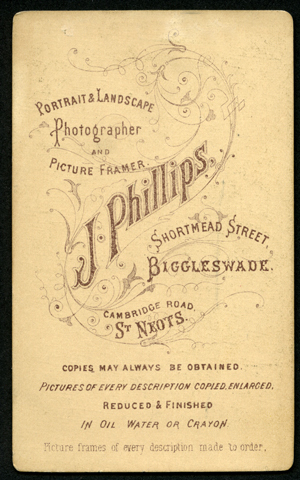 Subjects, styles, advertising, other relevant information: We know Elizabeth Peskett was a photographer because she exhibited in the name of Mrs Peskett, St Helens, Cambridge at the 1894 and 1895 annual exhibitious of the Photographic Society of Great Britain, later the Royal Photographic Society. In 1894 she exhibited a print entitled "Lowestoft Studies" taken with a hand camera, gelatino chloride print. In 1895 she exhibited two prints, "On dinner bent" and "The Pioneer". Elizabeth was the daughter of Richard Edgell, b: 1824 Uxbridge, a Colonel in the army, later Chief Constable of Shropshire, and Isabella J Edgell B:1831 Suffolk. In 1883 Elizabeth married Arthur George Peskett,b:1851 Beccles Suffolk. Arthur was a classical lecturer and fellow at Magdalene College Cambridge. He was admitted to Magdalene as a student in 1870 and retired from the College, a fellow and past President in 1912, he was the son of a suffolk physician. Elizabeth and Arthur had two daughters, Lilian Violet b: 1883 Cambridge and Stella Margaret b:1885 Cambridge. Lilian maried Sir John Evelyn Shuckburgh and became Dame Lilian Shuckburgh. Subjects, styles, advertising, other relevant information: In the 1891 Census Charles Pettit was shown as a photographer and surveyor, neither employed, nor an employer. He was living at the Gazeley address with his wife, Jane, b: 1863 Barrow, Suffolk, two sons and a daughter, all under 6, and nephew, William H Rosbrook, b: 1879 Culford Suffolk, a photographe's assistant. Ten years earlier, in 1881 Charles was a single man boarding at 34 Mill Lane, Bury St Edmunds, where his occupation was shown as a Government Surveyor. In 1901 Charles and Jane were living at Walton House, Pound Lane, Fordham, Cambridgeshire. By this time they had nine children. Charles was again recorded as a photographer and surveyor, working from his home on his own account. 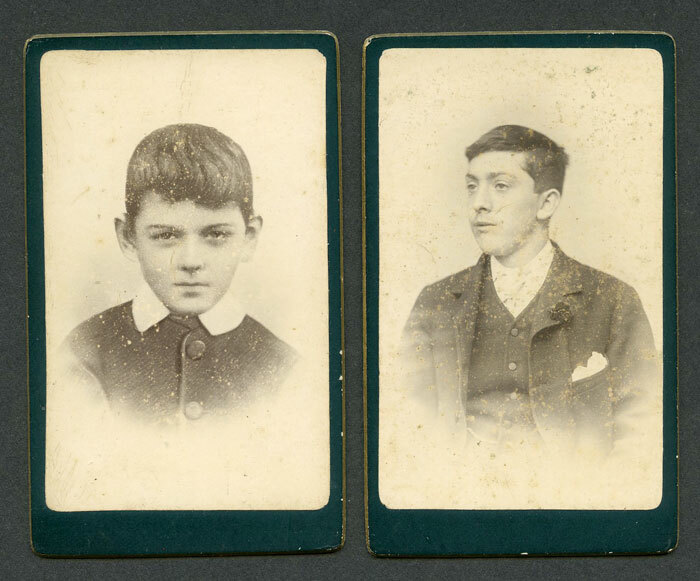 Their son, John b:1886 Tenby, was shown working from home, employed with the same occupation as his father. 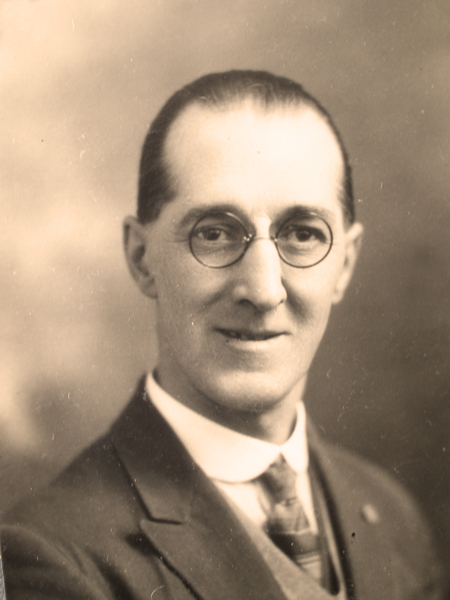 In 1911, Charles, described as a civil engineer and civil servant, was visiting London on census night staying at Cranston's Waverley Hotel, Southampton Row, London. In 1920 the firm was listed in local directories as Phillips and Sons, High Street, St Neots. 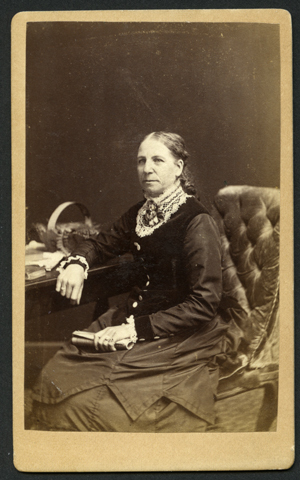 The first photograph below (author's collection) is a carte de visite of an unknown lady. 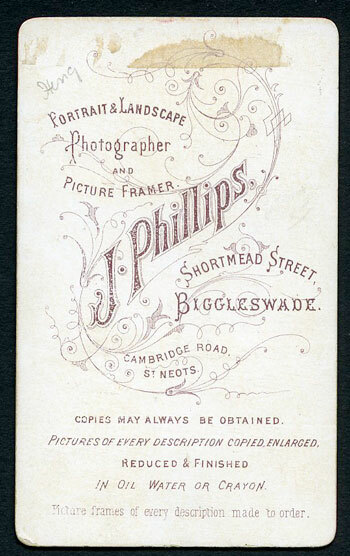 On the reverse in sepia ink is printed "Portrait and landscape photographer and picture framer, J Phillips Shortmead Street Biggleswade and Cambridge Road St Neots. Copies may always be obtained. Pictures of every description copied, enlarged, reduced and finished in oil water of crayon. Picture frames of every description" This dates from the early 1880s. Next is a very similar carte of father (with medals) and daughter, the name "Heng" is written on the reverse. In this example there is a red border to the face of the mount, otherwise it is identical to the previous example. Next are two cartes de visite on very fancy mounts, with dark green high gloss face and dark red high gloss reverse with gilt lettering. The text on the reverse is identical to the previous examples. They also have gilt edges. Presumably over time Phillips used ever more distinctive mounts. 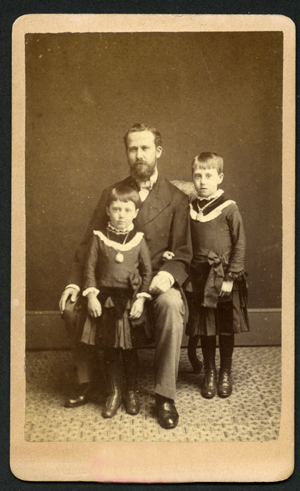 Below this is another carte de visite of a man with two boys (dressed in skirts - or is this some form of national dress?). 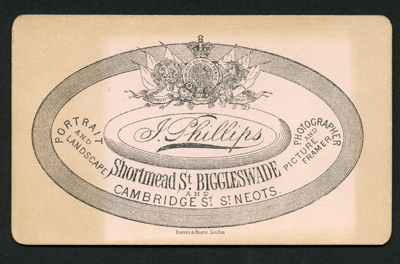 The reverse of this has an intricate royal coat of arms and the text reads "J Phillips Shortmead Street Biggleswade and Cambridge Street St Neots, portrait and landscape photographer and picture framer". The mount printer's name beneath the design is "Reeves and Hoare, London". This is probably from the later 1880s. (author's collection). 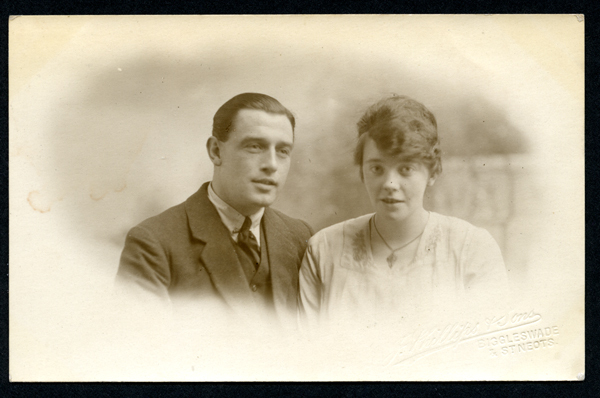 Below this is a postcard sized portrait of an unknown couple from the 1920s. 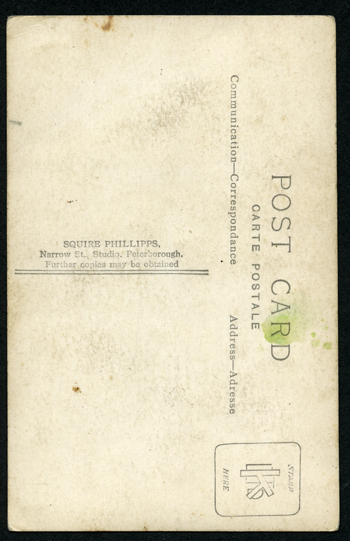 The reverse has a postcard back with no attributing text. Shown beneath the image is the detail of the embossing on the lower right hand corner, done with a hand embossing machine. (author's collection). In the Norris Museum, St Ives, Collection PH/EYNES/1 a-d, is a series of photographs of a cross in the churchyard of St Mary’s Church, Eynesbury. One of these images, mounted on card, is dry stamped “F.Phillips and E.Albone, The Studio, St Neots". The Church yard cross was by S.Inskip Ladds ARIBB Mkt Place Huntingdon. This suggests that Ernest Albone and Fred Phillips were at some stage in a partnership. Address: 1924 16 Narrow St Peterborough, Narrow Street Studio, 1931 Bridge Road, Peterborough, 1940 18A Bridge Street, Peterborough, 1958 6 Queen Street and (works) 18a Bridge Street Peterborough. Subjects, styles, advertising, other relevant information: At first sight it might have been thought that this firm was a partnership between two partners, surnames "Squire" and "Phillipps". But "Squire" is the unusual Christian name of photographer Squire Augustus George Phillipps. 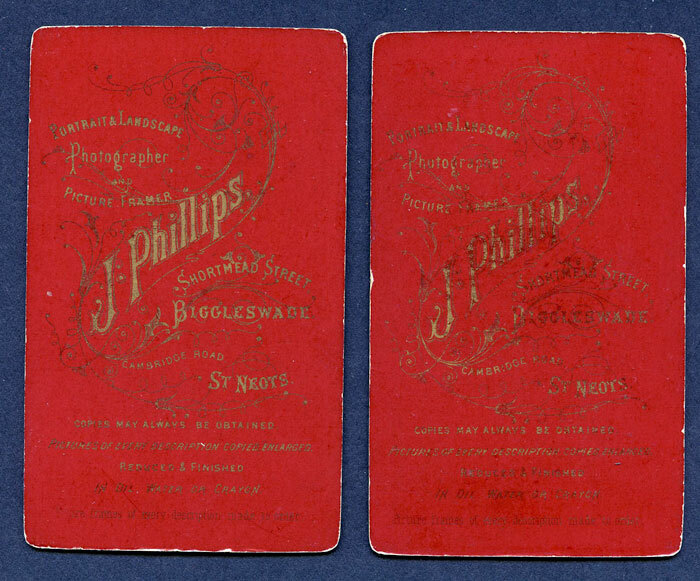 (Note the unusual spelling of the surname Phillipps with a double L and double P). Squire's parents were Arthur Augustus Wielopolski Phillipps b:1854 Liverpool and Grace Eliza Phillipps, Née Wood, b 1859 Wisbech. Squire's father was a wine and spirit merchant and in 1901 Squire was living in Southport Lancs where he was learning the family business. He married Florence Margaret Schofield (b:1882 Wigan) in 1906. In 1911 Squire was a book keeper and agent for a brewer, living at 16 King Street, Southport, Lancs. Squire and his wife Florence had three children born in Southport between 1909 and 1914. Squire's father's health declined after he had a stroke in 1909. At some point between 1914 and 1924 Squire changed his profession and moved from Lancashire to Peterborough. Squire is listed as a photographer in local Peterborough directories from 1924 to 1958 at the various addresses shown above. In earlier years there were other photographers working from Narrow Street or Narrow Bridge Street, Peterborough, but none at the same address as Squire, so he does not seem to have taken over an existing business, so why he chose to set up in Peterborough is not clear. 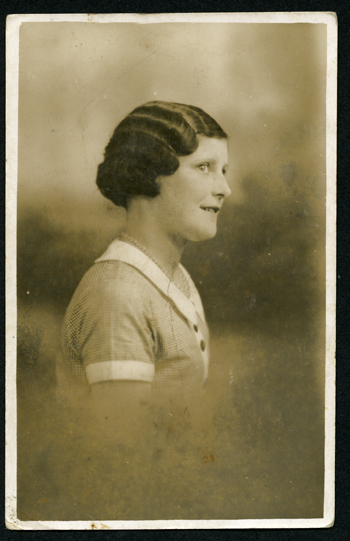 Squire and Florence split up at some point and Squire's new partner, Barbara Whitehouse (b: c1890 d: 20th August 1974) was his photographic assistant in Peterborough. In the 1939 Register Squire Phillips and Barbara E Phillips b: 13/10/1890, were listed as joint master photographers at 18 Bridge Street. Squire and Barbara married in 1954 in Anglesey. In 1957 Squire was interviewed by Mike Ewing, a reporter from the Peterborough Citizen and Advertiser, who recorded some of Squire's comments about his long photographic career in the City. This is an extract from the report, which clearly indicates that Squire used wet plate photography in the earlier days of his business. "....photography had been the reason for coming to Peterborough in the first place. For the modern cameraman conditions in those days would be a nightmare if they existed today. "The equipment - camera, tripod, flash gun and plates weighed a ton", he smiled reminiscently. "The plates themselves had to be used within 20 minutes of your coating them or they were utterly useless. I used to carry the lot around on a bike - solid tyres of course. I remember once cycling eight miles to a wedding, getting my pictures and cycling eight miles back to my little corrugated iron developing hut - a bit of a ramshackled place. I was in the midst of the process when a football crashed into the side of the hut and brought the place down about my ears. After eight miles ... and I could never get those pictures again..." People however were very photo-conscious in the early 1900s when young Squire first entered the business. "The family album was the thing in those days. And, of course, the photo boom came in the 1920s when a cigarette firm started giving away cameras." He was on the spot with his camera to record the turning of the first sod at Bishops Road for the bus park and swimming pool of today: to picture the first ditch of what became the electricity station... there are dozens more." Squire Phillipps was an accomplished musician, a pianist and a composer. Music featured strongly in his family - his grand-father was an infant prodigy in the 1830s and later a "professor" running his own private school of music. Strangely the photographic firm of Squire Phillipps continued to be listed in the local telephone directories at 6 Queen Street Peterborough until the 1969 edition, so it was possibly taken over by his wife, another family member or another photographer after Squire's death. Below is a self portrait of Squire Phillipps from the 1920s. 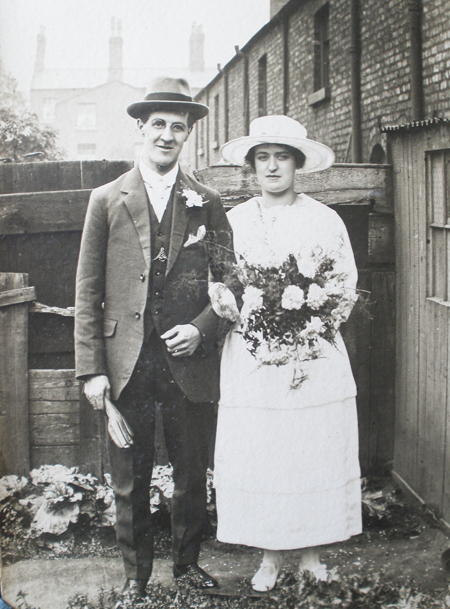 Next is a photograph of Squire and Florence at their wedding in 1906. Below this is a portrait of Squire's three children taken in around 1914 (all three photographs are from the Martin Baker Collection). Next are two photographs by Squire Phillipps printed with postcard backs. 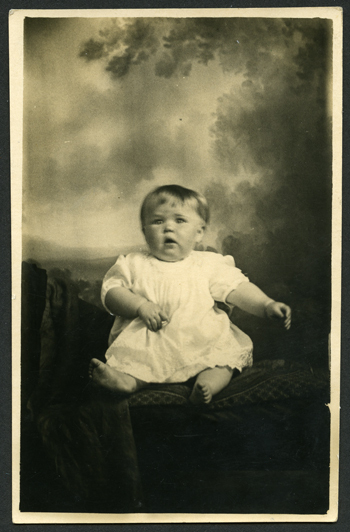 The second, of an unknown lady with a perm, is probably from the 1930s, and it is difficult to know whether the other, of an unknown baby, is older or later than this. 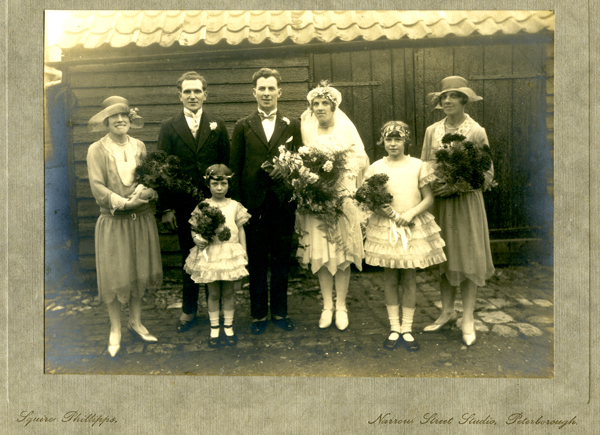 Next is a wedding group, from the 1920s, the photograph is 6in x 4.5in on a brown mount. The photograph is well taken, but posed in a cobbled yard with a wooden shed in the background. 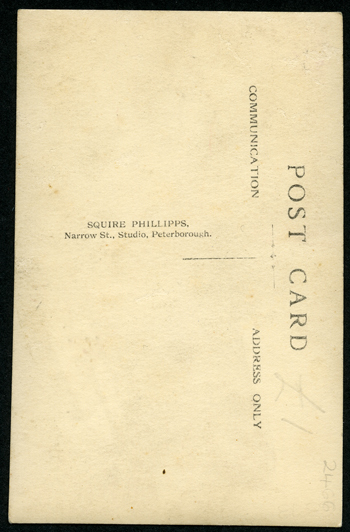 Printed on the mount is "Squire Phillips Narrow Street Studio, Peterborough". References: Kelly's Directory of Northamptonshire 1924, 1928, 1931, 1940. Kellys Directory of Peterborough 1958. The Peterborough Directory 1925, 1927. Peterborough Citizen and Advertiser Feb 15 1957 P 8. Extensive family history research kindly provided by Martin Baker. Working Dates: c.1995 to at least 2000. There is currently, in 2016, a photographers called Dion Gallichan Photography at 52 Station Road, Fordham, Cambridgeshire with 15 years experience, who may or may not be connected. PHOTOMATON or NEW PHOTOMATON. One of the earliest photobooths - US originated, sold in the UK from 1928 and in operation in places until the 1950s. Not yet known if any of these machines were in operation in Cambridgeshire - in addition to strips of photos they produced mounts and postcards branded with their name. See our page on Photobooths for more information. PHOTOWEIGH - machines producing a photograph with the customer's weight and date printed on the mount. Used in the UK c.1932-39. Not known if any of these machines operated in Cambridgeshire. See our page on photobooths for more information. Subjects, styles, advertising, other relevant information: This is the address for Stearn's who were also at the premises at that time. Company No. 02222747 dissolved 1990.